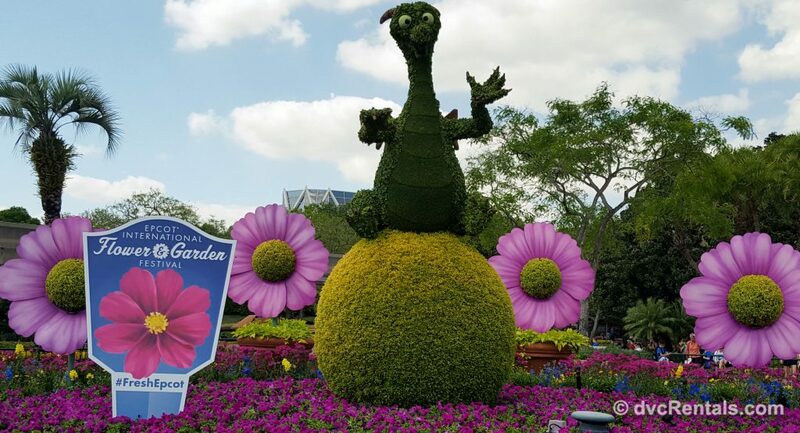 This year’s Flower and Garden Festival at Epcot began on March 6 and will end on June 3. This beautiful show first debuted in 1994, and has gotten longer and more elaborate with the passing years. This blog will concentrate on this year’s show. Park admission is required to attend, but many of the things to do and see are included with the price of entry to Epcot. While the majority of the flowers and topiaries are in World Showcase, quite a few can be found in Future World. 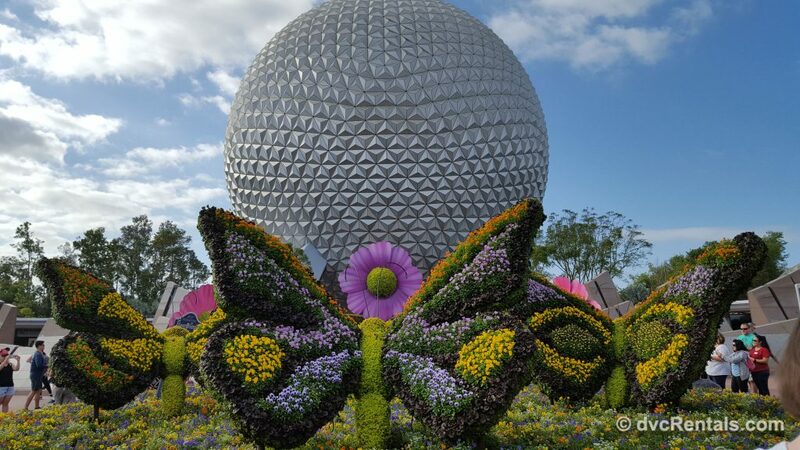 When you enter Epcot through the main entrance you will see signs welcoming you to the Show, as well as topiaries of butterflies. Try to remember to grab 3 things at the park entrance: A Festival Passport (chock full of info), a times guide and a park map. If you forget all three can be found at most kiosks and stores in Epcot. 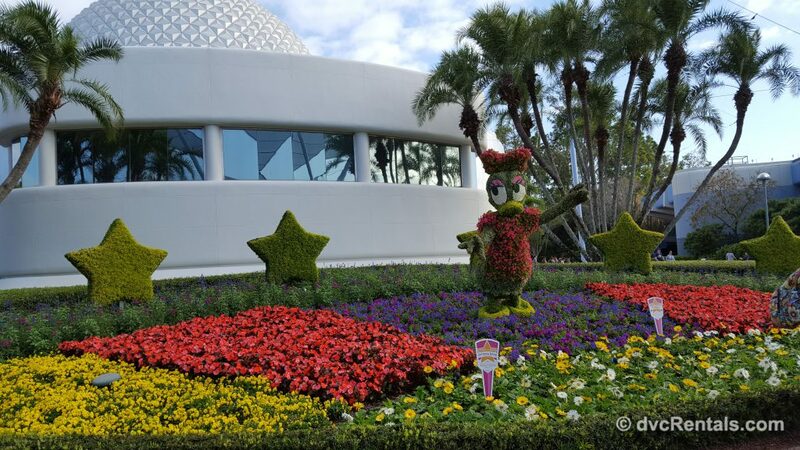 Continuing on, Daisy Duck topiary is behind Spaceship Earth, surrounded by beautiful flowers. If you take a left past Daisy, you will see the large store called Mouse Gear. 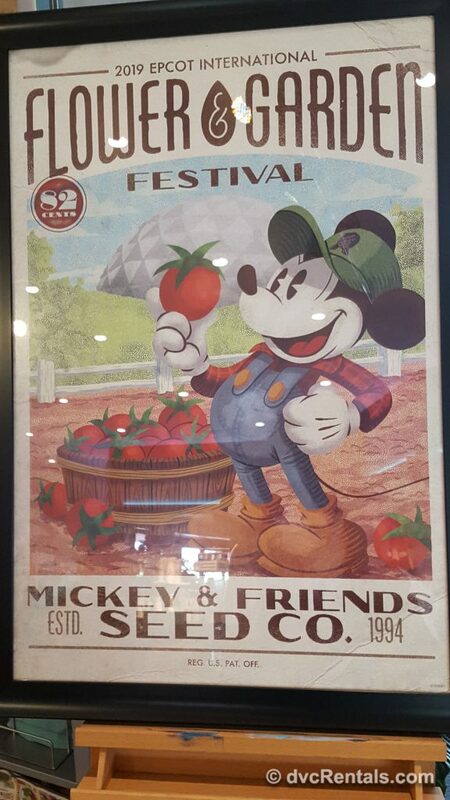 Some festival merchandise can be found here, and this is one of the places Annual Passholders can pick up a free magnet. Pluto is available until April 10, at which time Daisy Duck magnets will be given away to Passholders. If there are any leftover, Pluto magnets can be obtained after April 10, but there is no guarantee. 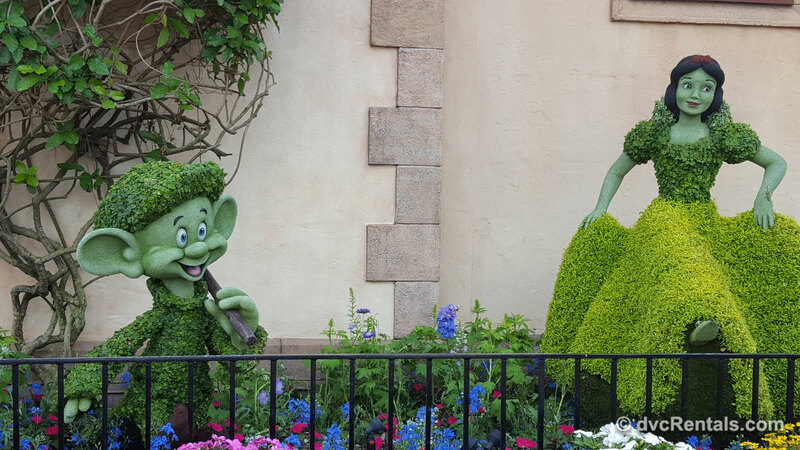 Behind Mouse Gear you will find a brand new topiary—Bo Peep and her sheep—and boy are they ever adorable! Bo Peep situated is between topiaries we have seen in the past, Woody and Buzz. They are all together in anticipation of the release of Toy Story 4, which is slated for June 21 of this year. In this same area behind Mouse Gear, there is a play spot for small children. Close by, you can see the Jammitors perform multiple times daily (check the times guide), they do a special show with a Flower and Garden theme. For those who already know about the Jammitors, it’s fun to see the unique show, different than the regular one they do. For newbies to this act, I highly recommend seeing them. They are Cast Members who dress like janitors, but their trash cans and buckets become drums, and they put on a fun, interactive show that lasts 10-15 minutes. If you then head towards Mission Space, you can see a topiary of Stitch. This topiary is not new, but the placement of it is. In past years Buzz Lightyear was in front of Mission Space. I suggest your next stop be the Odyssey Center, which, by the way, is the Flower and Garden Show Center. You can find this building between Test Track and the World Showcase Promenade. You will find TONS of merchandise here, more than I have seen in past years. Shirts, mugs, aprons, cookbooks and more are in abundance. 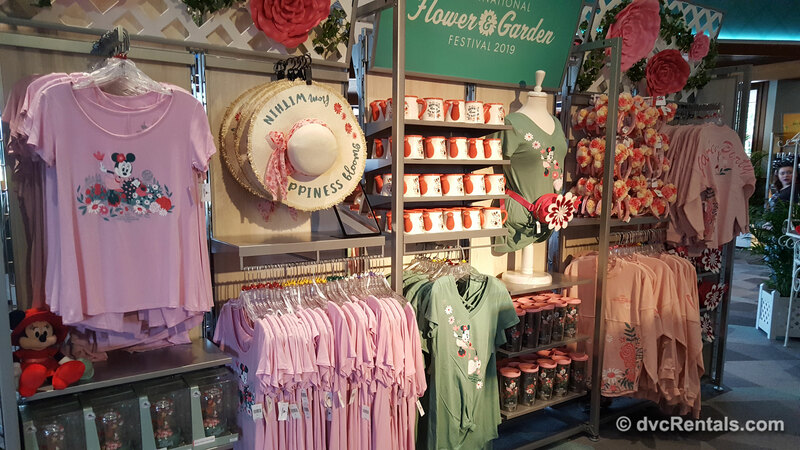 (There are also merchandise booths all along the World Showcase Promenade, but by far the best selection is found at the Festival Center). There is also a short movie at this location, with a Cast Member showing how topiaries are formed at Walt Disney World. While the food is not as abundant as Food and Wine Festival in the Fall, or as beautifully presented as the offerings at the Festival of the Arts in January, there are still plenty of choices for you foodies out there. It’s always a good idea to look at the Festival Passport (or the link I posted above) and see what interests you the most instead of winging it. You will be disappointed if you are full and reach a festival kitchen with something you would love to try. Of course, if you have more than one day to explore the show then it’s less important to whittle down the choices, as you can come back a second (or third or fourth or fifth, etc., etc.) time to try what you missed on a prior visit. I tried a few things; my favorite was a dessert that can be found just off the World Showcase Promenade on the path that would lead towards the figment ride if you kept going. 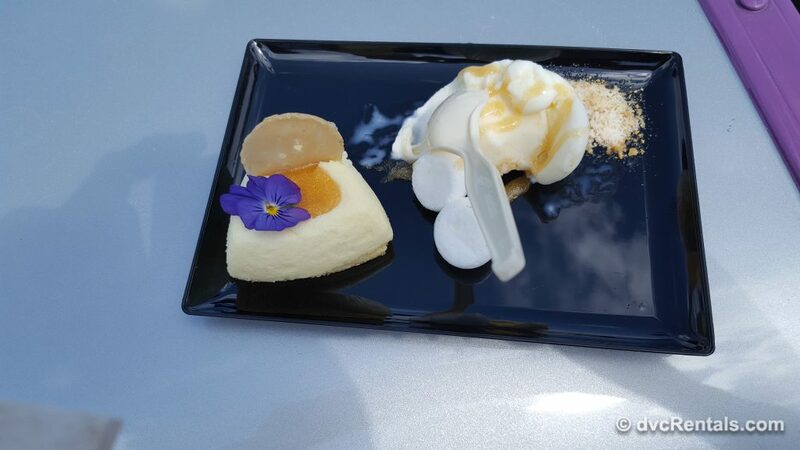 Called Honey Bee-stro, they have something called “Local Wildflower Honey-mascarpone Cheesecake.” It is a very creamy cheesecake, with a side of Orange Blossom Honey Ice Cream and meringue kisses. Wow was it good; I will have to get another before the festival ends. The portion size was very nice, for $5 I thought it was a very good deal as well as delicious. 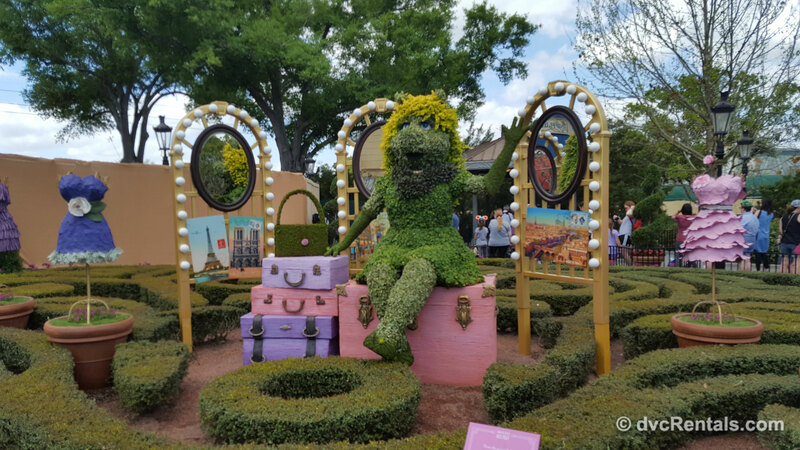 As you continue around World Showcase, you will see more topiaries, Outdoor Kitchens, and merchandise. Keep your eyes open, because some topiaries are in places you may not expect, especially if you have been to the show before and were used to seeing certain topiaries in certain places. Many have moved to new locations. I already mentioned Buzz moving from Mission Space to behind Mouse Gear. Another change I noted is for many years Lady and the Tramp were on the Showcase Promenade next to the Italy pavilion. This year they have moved across the way, to the water in the World Showcase lagoon opposite Italy, (and unless I am remembering incorrectly, they are also larger than past years). Snow White is still in Germany, but across from where she once was. And instead of all 7 dwarfs it’s just Dopey you will see this year—but a beautifully re-imagined looking Dopey, whose face looks more real than ever. 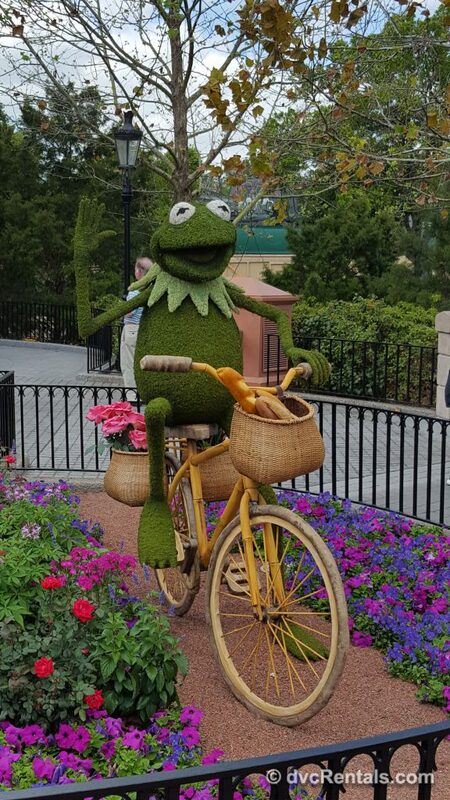 As I love the Muppets a favorite of mine is in France—Kermit is riding a Bicycle near Miss Piggy who is seated on luggage. 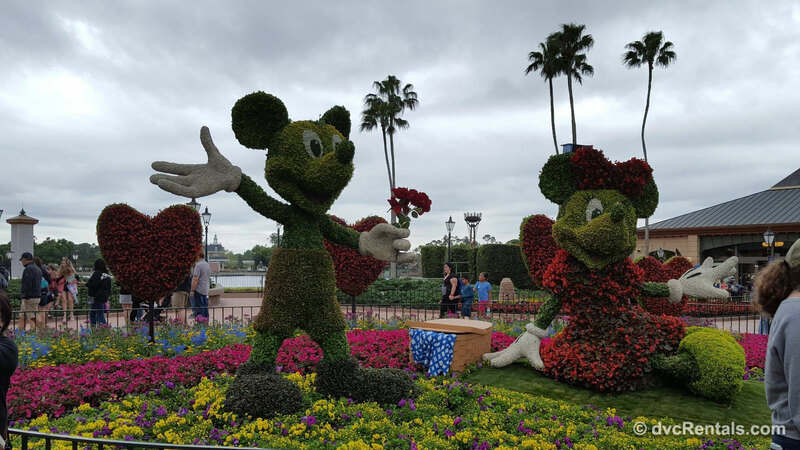 They have been part of the Flower and Garden show before, but the topiaries have been moved and re-imagined from their former look. 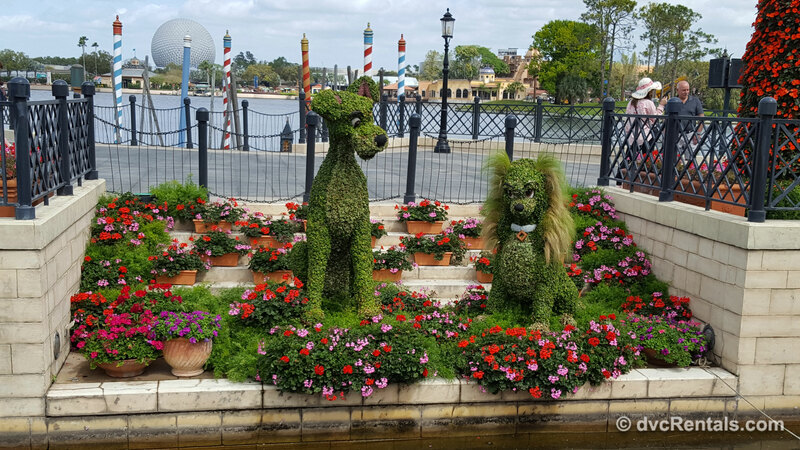 In total there are over 30 topiaries to be found at the Show, all of them are a sight to behold. We discussed the food, flowers, topiaries and more. What else is there to do at Flower and Garden 2019? Let’s see! Purple Martins (birds) breed and live in a specially designed house behind Mouse Gear. A butterfly house is located in Future World not far from Club Cool, the place where you can sample sodas. Look for the very big white tent. Inside you’ll see many species of plants and butterflies, as well as butterflies in their chrysalises, going through the change from being a caterpillar into a butterfly. There are many informative/educational signs in the Butterfly House as well. In the UK you can take a “Tea Garden Tour”, where you will learn about techniques for blending tea and discover the history of English Tea Gardens. This is free, but cannot be booked in advance. Sign up the day you are there at the Tea Caddy store in the UK. The Tea Caddy shop also offers a free brochure for you to take a self-guided tour of the gardens in the UK. For those wanting a more elaborate tea tour, for $20 you will be able to learn more about the herbs that go into making tea. You’ll also be served tea and scones on this tour, which can be booked in advance by calling 407 WDW-TOUR. 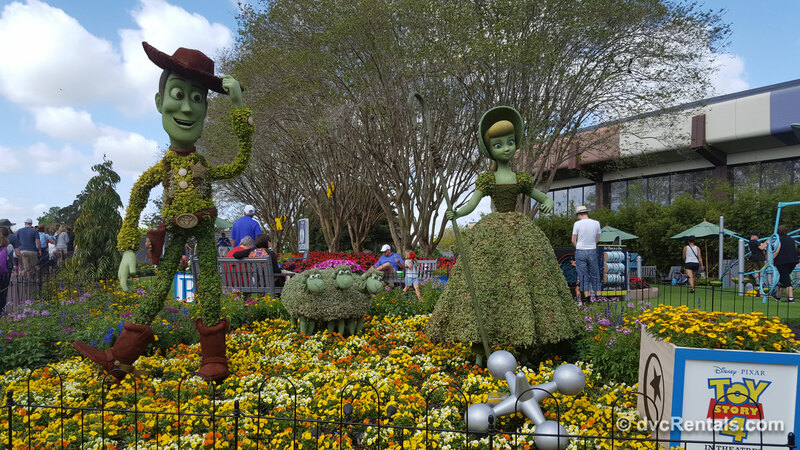 World Showcase offers a tour that is only available during the Flower and Garden Show. Called Epcot Gardens of the World Tour and lasting 3 hours, a Cast Member will guide you through World Showcase, explaining how the displays were created. 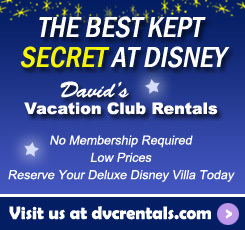 This is best to book in advance at 407 WDW-TOUR. The cost is $85 per guest and is held on Monday, Tuesday, Thursday, and Friday from 9:00 AM to 12:00 PM. In addition to the kiddie playground mentioned earlier, there is another play area for young children located on the path that leads from World Showcase to Future World on the side that leads to the Figment attraction. There is a Scavenger Hunt called Spike’s Pollen-Nation Exploration. Spike is a cute bee that appears in many spots around the World Showcase Lagoon, and your job is to find him in his various hiding places. You can purchase a map with stickers at the Festival Center; Disney Traders; Port of Entry (the previous two are found at the center of World Showcase promenade when you first enter from Future World); Pin Central and World Traveler (the store that is located near the International Gateway, Epcot’s “back door”). Once you’ve found all the bees and put the stickers on your map, bring it to World Travelers or Disney Traders for a special prize. Economical suggestion: You do not have to buy the map to play the game. Everyone is welcome to search for Spike; he is right out in the open at the various countries in World Showcase. Take a look at the train set-up in Germany. 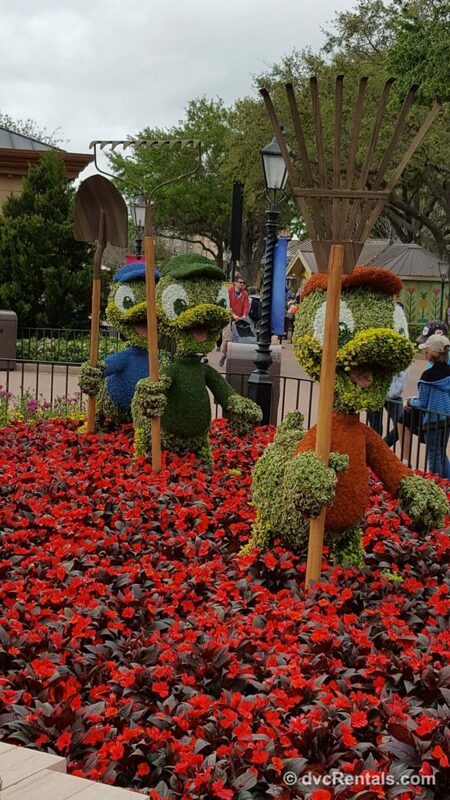 While that display is there year round, they have added a mini Flower and Garden show complete with tiny little signs. It is adorable. There are more than 10 acts this year who have never performed at the Flower and Garden Show before, in addition to the many returning favorites. Show times are 5:30, 6:45 and 8:00 PM daily. 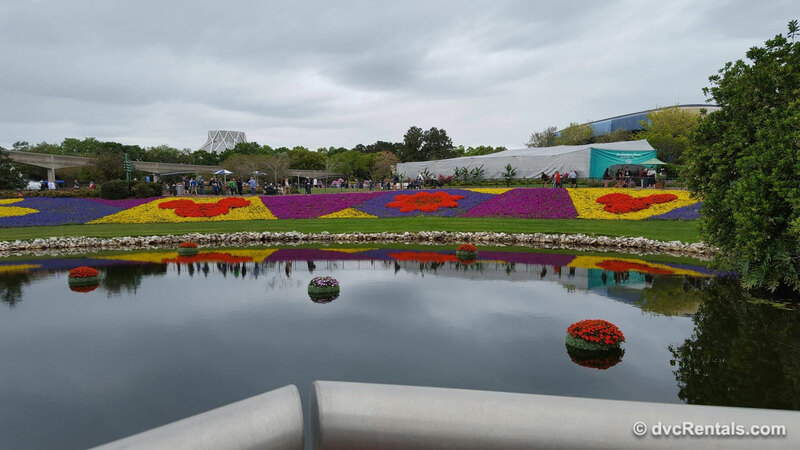 If this is your first time attending Epcot’s Flower and Garden Show you are in for quite a treat. However, it’s one of those events that most people can enjoy over and over again. 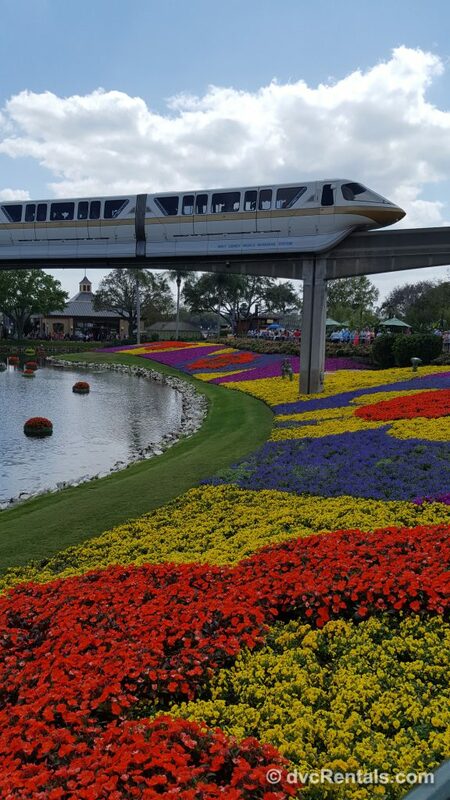 Not only is it most definitely the prettiest time of year to go to Epcot, there is something for everyone to enjoy, young and old alike. My first time seeing the Show was 1996, and I never tire of it. 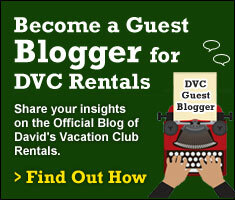 © The Official Blog of David's Vacation Club Rentals - All Rights Reserved. Website Designed & Hosted by Capitol Technologies.